The session generated a lot of interest. In fact, I spent the next 5 hours answering questions and taking photos with people. It sounds kind-of crazy, but it was really good fun. As a result, I didn’t get to see any sessions, but as I said yesterday, I feel my purpose here is to connect with people and that is exactly what I did for 5 hours straight. Thanks to everyone that came to speak to me. You made me feel very special and I hope I was able to help you. It never ceases to amaze me what an impact one little website can have! From there it was on to the closing talks. In addition to the normal closing speeches, there was a motivational talk by DR Rajdeep Manwani. I really enjoyed the talk and judging by the reaction of the crowd, so did everyone else. The talk used several anecdotes and his personal experiences to put across the message that your success or failure is your responsibility. You can blame others when things go wrong (external locus of control) or take personal responsibility (internal locus of control). Ultimately, successful people are those that take personal responsibility and do something about it, rather than blame the world for their failings. I wholeheartedly agree. After that I spent some time saying my goodbyes, then it was off to get some food and then to bed, ready for my early start for the trip home. I would like to say a big thank you to the AIOUG for inviting me and to all the AIOUG volunteers that made the event go so well. Thanks also to the Oracle ACE Program for getting me to the event. My special thanks go to all the attendees that made me feel really special for two days. Tomorrow is the journey home. Fingers crossed for free upgrades to Emirates business class! 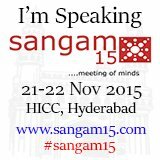 AIOUG Sangam15 : Day 2 was first posted on November 22, 2015 at 4:19 pm.